Want to learn about exploiting exosomes for therapeutic use in patients with cystic fibrosis? Have questions answered during our two sessions presented by ProQR Therapeutics and University of Oxford. This presentation will examine the translational applications of exosome research, including biomarker discovery and drug delivery. The session will consider and evaluate of the important advantages compared to other nanoparticulate drug delivery systems and look at ways of overcoming potential problems with component characterization and immune reactions. 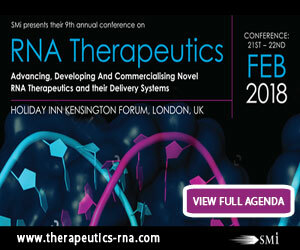 This session will explore the opportunities that RNA therapeutics may bring for patients with cystic fibrosis. The evidence for QR-010 as a meaningful RNA therapeutic for patients with cystic fibrosis will be discussed, looking specifically at the F508del mutation. Other mutations will also be explored while looking at RNA therapeutic approaches for patients with cystic fibrosis. – Hear from MiNA Therapeutics about their new pre-clinical data supporting the on-target mechanism of action of their pioneering new drug candidate MTL-CEBPA. – Learn how CureVac’s sophisticated technologies and approaches have helped overcome limitations such as the instability of single-stranded RNA. – Discover STORM Therapeutics’ innovative approach: Harnessing the power of RNA epigenetics to develop first-inclass drugs in oncology. – Expand knowledge of patenting RNA Therapeutics, with James Ogle, a European and UK Chartered Patent Attorney with particular expertise in RNA and other nucleic acidbased technologies. – Examine the latest developments in delivery systems for RNA Therapeutics, including Exosomes, Nanocomplexes and Platform Delivery Approaches.